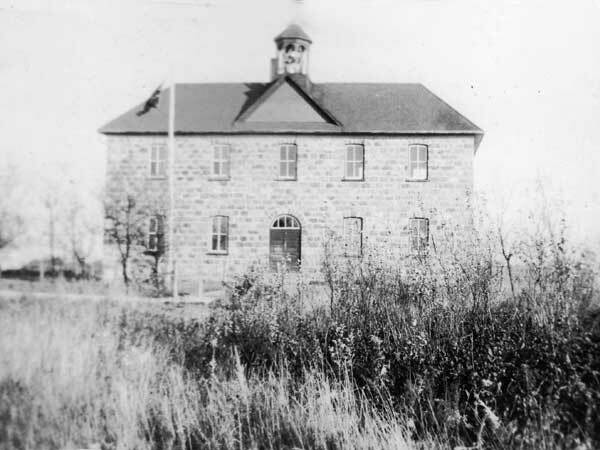 In May 1892, the Holmfield School District was established formally and classes were held in the home of George Armstrong in the village of Holmfield in the Rural Municipality of Turtle Mountain. By 1901, it had become overcrowded and local ratepayers authorized the construction of a new schoolhouse at a cost of $3,500. Work by contractor D. Barlow began that summer and was completed by September. It was a two-storey stone structure with three classrooms, a large meeting room, and a basement. Demolished in 1951, the stone school was replaced by a one-storey building, constructed at a cost of $24,000 and opened officially on 3 April 1951. In January 1959, the district consolidated with Hazeldell School No. 611 and West Derby School No. 194 to become Holmfield Consolidated School No. 699. The high school closed in June 1959 and the school as a whole closed in June 1974. The building was later demolished and its bell sits atop the Bank of Toronto Vault. Some records for the school are held at the Messner Store Museum. The other teachers of Holmfield School were: Frances Balfour (1892-1893), James C. Butchart (1893-1894), Joseph McKee (1894-1895), R. W. E. Preston (1895), A. G. Lanigan (1895-1896), J. D. Nicol (1896-1899), Marnie E. Sargent (1899-1900), James G. Dunlop (1900-1901), Louis McKinn (1901-1902), H. Heasman (1902-1903), Miss Greenway (1903), Robert Moir (1905-1906), Grace L. Hicks (1905-1907), Lillian Coulter (1906-1908), Nellie Martin (1908-1911), Cecelia A. Cresswell (1910-1911), Laurinda Martin (1911-1912), Janet A. Pritchard (1911-1915), J. A. Peadon (1914-1916), Frances M. Porter (1916-1917), Retta Davis (1916-1918), Winnifred W. Collis (1917-1918), Mildred A. Bateman (1917-1919), Ilo M. Nelson (1918-1919), S. Estella Carruthers (1918-1919), Marjorie Davidson (1919-1920), Jessie Knox (1919-1920), Helen F. Wiechman (1920-1922), Cora L. Hefford (1920-1922), Edith H. Gee (1921-1923), Fern Morden (1922-1924), Mary E. McMillan (1923-1924), Mary R. Wiechman (1923-1924), Maude E. Rutherford (1924-1926), Elsie R. Jones (1924-1926), Elsie B. Fisher (1925-1926), Evelyn H. McPherson (1926-1929), Mildred A. Lousley (1926-1927), Hilda M. Huddlestone (1927-1943), Christina D. Hunter (1929-1931), Isabella M. Jamieson (1931-1938), Charlotte I. Lynch (1938-1940), Dorothy H. Dutton (1940-1941), Eva M. Lyons (1941-1945), Dorothy McMillan (1943-1945), Florence Clucas (1945-1947), Margarette B. McNabb (1945-1946), Frances E. Havard (1945), Mary Rankin (1946), Ila T. Cockriell (1947-1949, 1950-1955), Jessie H. Neufeld (1947-1948), Sigrun B. Sigurdsson (1948-1949), Sarah B. Steel (1949-1952), R. L. Duane Duff (1949-1950), Mabel E. Sabad (1952-1953, 1957-1965), Enid I. Cobbledick Brogden (1953-1956), Marilyn P. Gusdal (1955-1957), Tena Moffat (1956), Elizabeth Grierson (1957-1968), Harry F. Tiessen (1964-1965), Leanore E. B. Knight (1965-1967), Alice I. McKnight (1965-1967), Patricia B. Porter (1967-1969), Marlene L. McKelvey (1967-1968), Shirley M. Langan (1968-1974), Jill Gwynne (1968-1969, 1971-1972), Jessie H. Duerksen (1968-1970, 1971-1972), William S. Kirbyson (1969-1970), Dale W. Armstrong (1969-1970), Owen J. Wallis (1970-1971), Joseph A. Mayers (1970-1972), Trudy Grey (1971-1972), and Robert F. Renshaw (1972-1974). GR8461, A0233, C131-1, page 111. “Holmfield, Man”, Western Canada Fire Underwriters’ Association map, 1919, Archives of Manitoba. “Holmfield school to close,” Brandon Sun, 20 June 1974, page 3. By the Old Mill Stream: A History of the Village of Holmfield & District by Holmfield History Book Committee, 1982. We thank Nathan Kramer and Duane Duff for providing additional information used here.